Sooraj Barjatya's film 'Prem Ratan Dhan Payo', which garnered positive response from the audience, bagged four awards at the BIG Star Entertainment Awards 2015. ‘Prem Ratan Dhan Payo’ bagged four awards at the BIG Star Entertainment Awards 2015. Filmmaker Sooraj Barjatya’s latest film “Prem Ratan Dhan Payo”, which garnered positive response from the audience, bagged four awards at the BIG Star Entertainment Awards 2015. The film’s lead actress Sonam Kapoor got the BIG Star Most Entertaining Actor – Female in a Romantic role. The film also bagged an award for the BIG Star Most Entertaining Romantic Film Of The Year. Apart from this, singer Himesh Reshammiya walked away with the BIG Star Most Entertaining Music award for the Salman Khan-starrer. Singer Palak Muchhal received an award for BIG Star Most Entertaining Singer (Female) for the same film that has a royal tale. Palak made the show’s host Bharti Dubey do the signature step of the film’s title track, for which she won the award. Shoojit Sircar’s “Piku”, a slice-of-life film, got three awards for different categories at the ceremony. Megastar Amitabh Bachchan, who plays a quintessentially Bengali man in the film, was honoured with the BIG Star Most Entertaining Actor in a Drama Role (Male). Deepika Padukone, who essays the role of his selfless daughter, won the BIG Star Most Entertaining Actor in a Drama Role (Female). 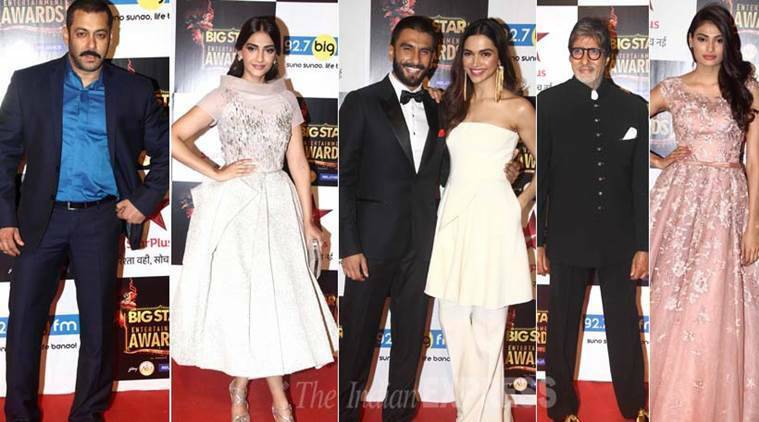 “Piku” won the BIG Star Most Entertaining Drama film. Amitabh thanked the writer of “Piku” Juhi Chaturvedi, along with the entire star cast for making such a film. Actor Varun Dhawan, who has proved his versatility with his performance in the action-thriller film “Badlapur” – bagged two awards – BIG Star Most Entertaining Actor in a Thriller Role (Male) and BIG Star Most Entertaining Actor in an Action Role – Male/Female, for which actors like Aishwarya Rai Bachchan and Akshay Kumar were also nominated. A number of Bollywood celebrities including Salman, Deepika, Ranveer Singh, Varun, Kabir Khan, Remo D’Souza and Saroj Khan graced the awards ceremony, held here on Sunday (December 13).